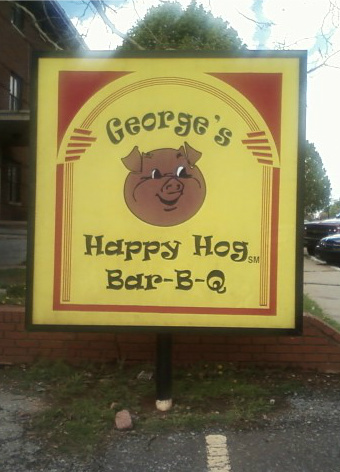 I had been wanting to try George's Happy Hog for a long time. Problem was I couldn't find it. I would look it up on Google Map. Get a general idea where it was and then when I would go looking for it I just never seemed to be able to find it. Well guess what.... I finally found it but it took me about 40 minutes of driving in circles to get it done. Was it worth it? Well you'll just have to keep reading to find out. 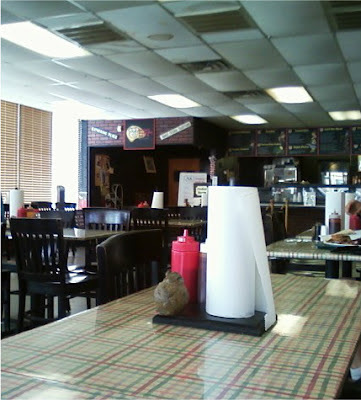 When you walk in to George's the first thing you'll notice is a pleasant smokey smell. That's not always a sign of good BBQ but it got my hopes up. They offered 2 and 3 meat combo plates but then I noticed they had a 4 Meat Sampler. I was hungry after 40 minutes of driving and being my first trip to George's a 4 meat sampler sounded good to me. 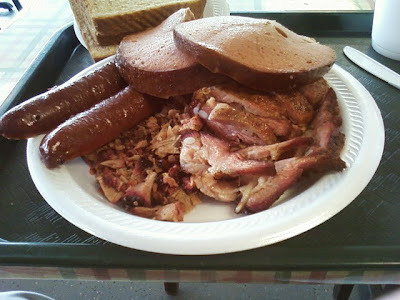 The 4 Meat Sampler comes with rib ends, sliced or chopped brisket, a sausage, and bologna... CHA-CHING! 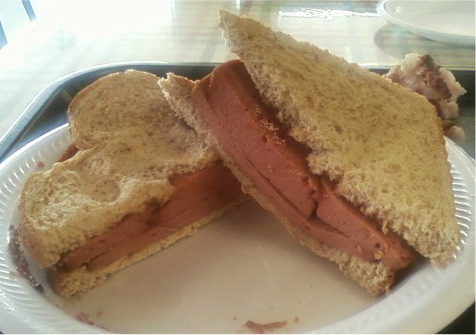 You know I've got a thing for smoked bologna! I chose the chopped beef and added a side of Creamy Mac & Cheese. You also get a choice of white or wheat bread. None of that goofy one sided toast at the Happy Hog. The rib ends were pretty good. The smaller ones were better than the bigger ones. The bigger ones were just a bit tough but they all had good flavor. I saw another patron eating ribs and the ribs appeared to have a lot more color than the rib ends. It was almost like they have trimmed the spares St. Louis style and then rubbed the ribs but just smoked the ends with no rub. Whatever they did it worked. I ate every last one of them. 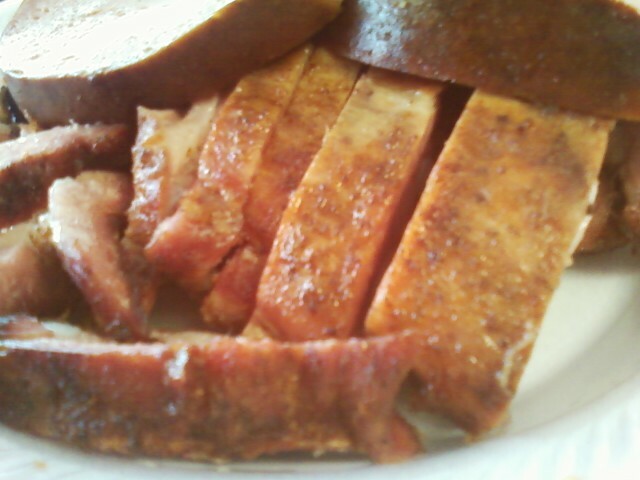 The chopped brisket had good color, good flavor, and was moist. Those are three good qualities to have in brisket. Especially for a picky brisket eater like me. It doesn't look like I got much in the picture of the 4 Meat Sampler above but it actually covered the entire bottom of the plate. The portions were really good for the price. I've paid a lot more for a lot less at other Q-Raunts. It didn't need it but I sampled some of the sauce on the beef. 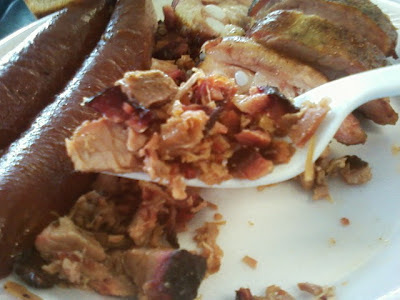 It was your typical sweet, slightly smokey, with just a hint of heat BBQ sauce. It complemented the meat but like I said. It wasn't needed. Look at the size of those slices of bologna! This was the last thing I ate and I was already pretty stuffed but I somehow managed to power through it. Don't ask me how. My stomach was saying "Stop already!" but my tongue was saying "Shut up stomach. It's freaking smoked bologna!!!". The smoked sausage was good but it was just your typical Ekrich type polish sausage. It was a link, not a ring, but the texture was lacking. When I saw the "Creamy Mac & Cheese" on the menu the "Creamy" sold me. Unfortunately this was the one low point of my visit. 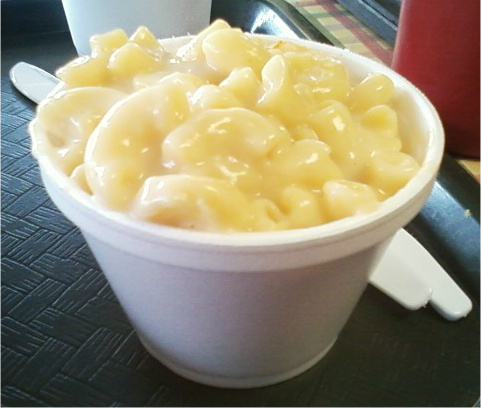 It was just slightly overcooked elbow macaroni with some kind of pre-made just add some liquid cheese sauce. If that's what you like then George's is what you are looking for. It's just not for me. Overall I enjoyed George's Happy Hog, now that I finally found it. It is just your typical Okie Q-Raunt. I wouldn't stand in line for it and I wouldn't drive 5 hours for it but it was good enough I'll be going back.